Since tucking in, my DB (who unfortunately is very fond of Christmas cake, meaning less for me...) and I have made it a point of getting out and about at the weekend in order to walk off the effects of delicious but calorie-laden cake. Being in a bit of a January slump, we have not wanted to travel far. Our aim is to get out at the best time of the day and to do roughly 10,000 steps, after which we can stuff our faces with cake happily guilt free. This month has seen us head half an hour on narrow winding roads north to Domaine du Mas Neuf near Lauret, and forty minutes or so on the main road west to the Forêt Domaniale de la Gardiole just south of Gigean. 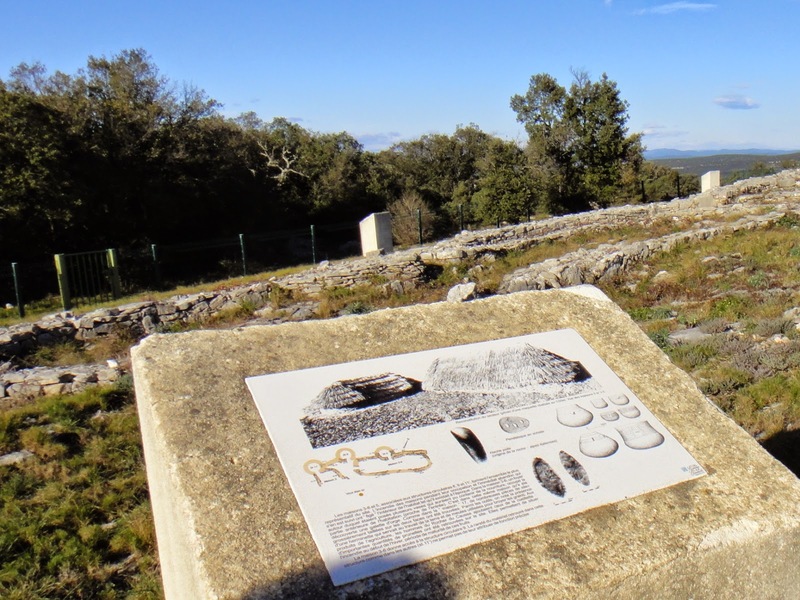 Hérault has been inhabited since time immemorial and we saw some of the vestiges of ancient habitations at the top of a rocky spur (éperon) overlooking Lauret. They date from chalcolithic times, 2200 BC. The view from the top offers a 360°C panorama that, on a clear day, stretches 100 km towards Mont Ventoux to the east, and 47 km north to Mont Aigoual. You can also see the sea, and blow away the cobwebs. 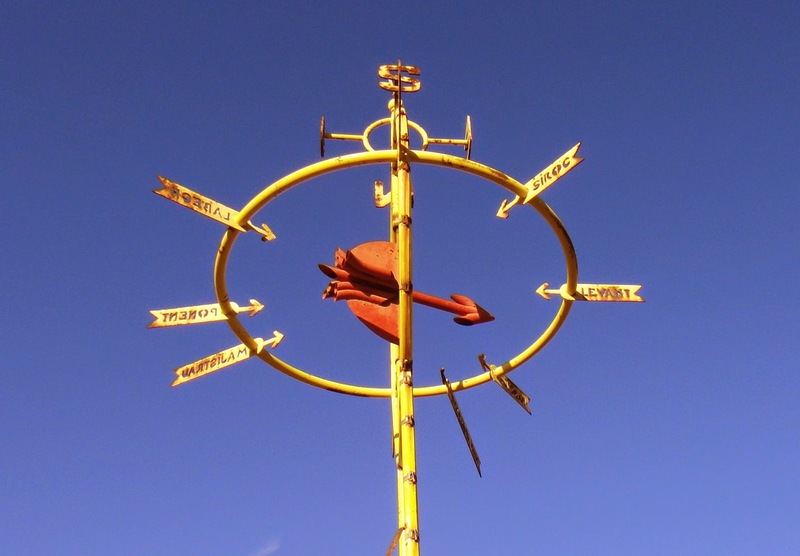 There are several winds that blow across the region, and they are identified at the top of the viewing point which is the best spot to admire the views. 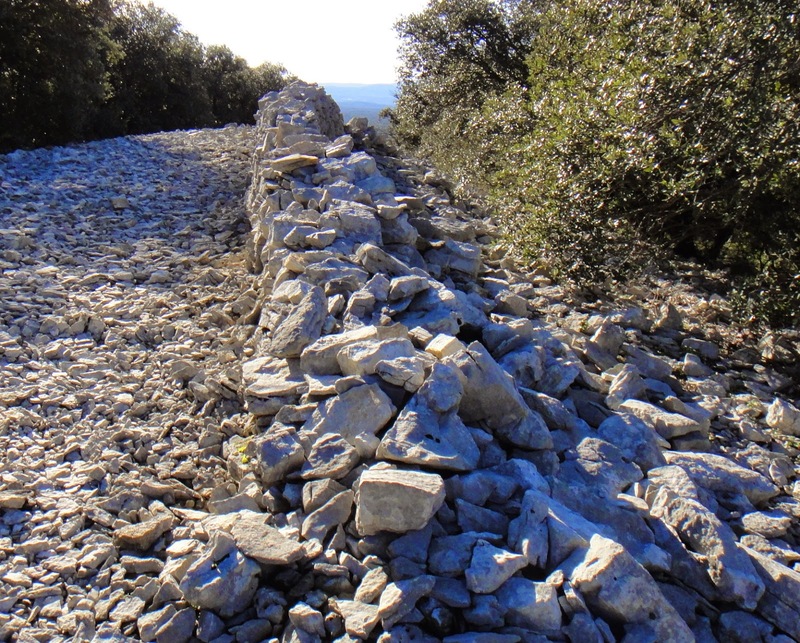 As you can see, we are not short of a wind or two in Hérault! How's that for a blue sky? ...funnily enough, we came across a refuge on our walk through the Gardiole forest. There was the same type of dry stone wall construction, and a restored (or original) refuge. We were on a discovery path which had little stone labels to identify the local flora, so I found out that the annoying, vicious little holly-lookalike bush that is native to the garrigue is actually called Chêne kermès. It grows and is cut back regularly in the pine wood opposite my house with the result that you cannot stroll through the wood in sandals because you get attacked by its nasty ground-level spiky leaves which lodge themselves painfully under your toes until you pick them out. Anyway, I now what the stuff is called. It was a couple of hundred metres beyond this point, after a slog uphill that I suddenly remembered that I hadn't locked the car. Or had I? Oops. I couldn't remember, so after a bit of humming and hahing I thought I'd better go back and check, and discovered that I hadn't. Nothing unfortunate had occurred, so we set off again along a different path which took us to the top of the hill, a lovely wide path, and some spectacular views. I don't know which wind was blowing that day, but it was certainly doing a good job chasing away the clouds and clearing the lovely blue sky. We enjoyed views west towards the extensive port of Sète, and the town behind, and east over the lagoons to Villeneuve-lès-Maguelone and Palavas-les-Flots. The sea was a stunning azure blue. The view towards Vic le Gardiole and sea suggested to me how the area might have looked before so much of the land was drained. You can see the swampy wetlands behind me which is how I imagine it must have been like right across Languedoc-Roussillon. The region was certainly mosquito-ridden, and malaria was common right up until the twentieth century. During a lull in the wind, we managed to find a sheltered spot in the sun to have our lunch, away from the hunters and their fluorescent jackets, dogs, horns and guns. Just as we were finishing, the wind picked up again, so I gave thanks to the wind gods for their kindly respite. Maybe they'd stopped for lunch too. We had parked the car in the car park serving the ruined Abbaye Saint Félix du Montceau (11-13C) and decided to have a look around upon our return. I'd visited the abbey before, but restoration is under way, so it looked different to the last time I'd been there. The grounds are a pleasant place to stroll; you can see the remnants of the prison, pilgrims' quarters, herb garden, infirmary, and so on. Some replanting of the medicinal herb garden had taken place, with labels to identify the plants. I seem to remember this is a very popular place in warmer weather, and even on a chilly January day, the car park was half full by the time we came back. This could have been because there was an added attraction of donkey rides for the kiddies. We'd passed a donkey stables on our way up with lovely winter-coat-fluffy donkeys standing peacefully about in the paddock. My treat upon return was a lovely Yorkshire cuppa with a fat slice of Christmas cake. Thanks mum! I think you deserved a big slice after all that fresh air. Did you go inside the little refuge in the dry stone wall? Hi Anya, we did those walks over a couple of days, and I even did the Mas Neuf walk twice as I went back with my youngest. Those are some lovely places, if I might say. Makes me want to get out and explore a bit more than we already do. Lovely walks. I especially like the history along the way. And christmas cake at the end - perfect! The ruins were a nice surprise, I must say, and as they are similar to others in the region, I got a feeling of community and continuity, trade and society.